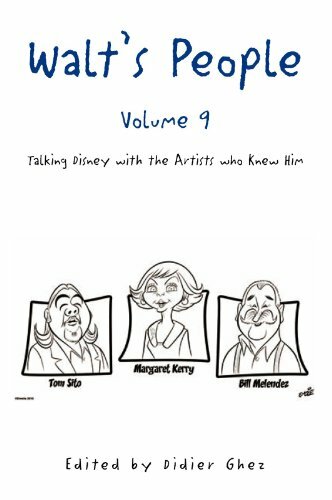 by Didier Ghez 2010 published by Xlibris, Corp.
"The Walt's People series, edited by Didier Ghez, is a collection of the best interviews ever conducted with Disney artists. Contributors to the series include noted Disney experts Robin Allan, Paul F. Anderson, Mike Barrier, Albert Becattini, John Canemaker, John Culhane, Pete Docter, Christopher Finch, J.B. Kaufman, Jim Korkis, Christian Renaut, Linda Rosenkrantz, Dave Smith, and Charles Solomon. Walt's People - Volume 9 features in-depth interviews with Ken Anderson, Art Babbitt, Jack Bradbury and Mary Jim Carp, Paul Carlson, Les Clark, Jack Cutting, Jack Ferges, Bob Foster, Joe and Jennie Grant, Victor Haboush, Thurston Harper, Fred Joerger, Ollie Johnston, Bob Jones, Margaret Kerry, Burny Mattinson, Frank McSavage, Bill Melendez, Ken O’Connor, Walt Peregoy, Thor Putman, Fanny Rabin about Art Babbitt, Art Scott, Tom Sito, Julie Svendsen, and Berny Wolf. It contains hundreds of new stories about the Studio and its artists and should delight even the most serious historians and enthusiasts. Walt's People is a notable new source of historical treasures and should give new energy to the world of Disney research! This book is neither authorized, sponsored nor endorsed by the Walt Disney Company and its subsidiaries. It is an unofficial and unauthorized book. The mention of names and places associated with the Walt Disney Company and its businesses are not intended to infringe on any existing copyrights or trademarks of the Walt Disney Company, but are used in context for educational purposes. The opinions and statements expressed in these interviews are solely the opinions and perspectives of the authors and the interviewees and do not necessarily reflect the opinions and policy of the Walt Disney Company and its businesses."